Last weekend my father journeyed from afar…well Phoenix, to join me for what turned into a non-stop adventurous weekend! It all started with the fact that he, an avid Jimmy Buffett fan and my reason for loving his music, has never been to a Jimmy Buffett concert. So for his birthday (which is in June actually) I purchased a pair of tickets for us, and promised a fun weekend in LA. The concert was fabulous, but the highlight of the trip for me was going to be getting him underwater for the first time in about seven years! (that is not counting the numerous 5ft, 15 minute dives he made out in Saguaro Lake cleaning algae growth off the underside of our ski boat, which I don’t). The last time he actually dove was the first time I did. 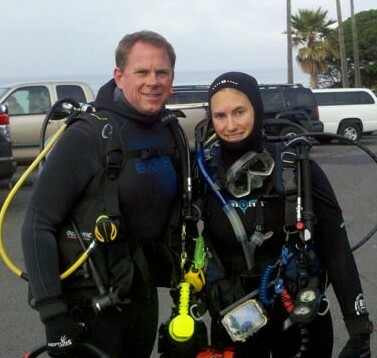 Back in 2003 on a family vacation to Maui, my sister and I earned our Open Water Diver certifications. On our final open water dives he joined us for a trip out to Molokini and St. Anthony’s wreck, then later we did a shore dive with all four of us (including my mom) on the small reef just off shore from our hotel. Flash forward seven years, and I’ve earned my OWSI rating and put more than 100 dives under my belt and he’s barely been wet. It sure looks like I have a ton a gear! Mostly because of my camera, and because all my Dad’s gear looks like its actually hanging off me! We had driven down to San Diego to dive with a friend of his who is a big lobster hunter. 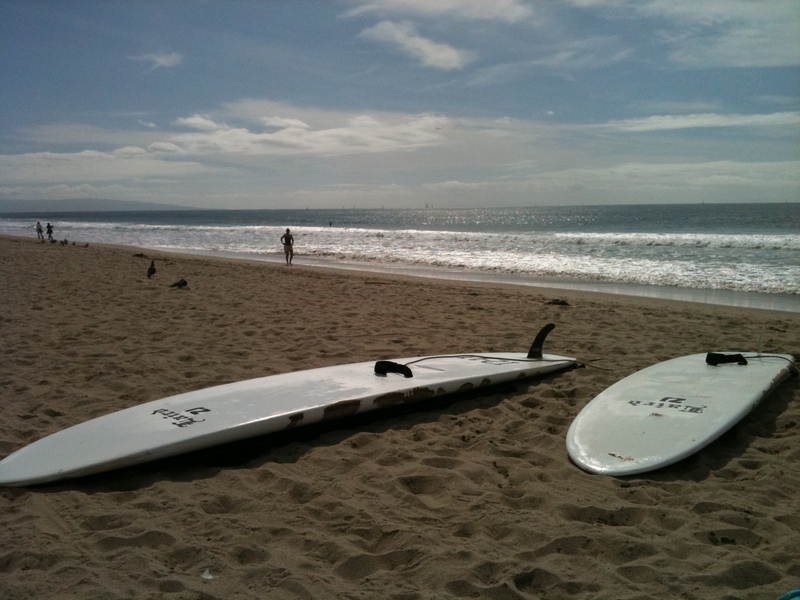 He took us out to Swami’s, a beach in Encinitas known primarily for great surfing. I could easily see why, as a nearby reef created a perfect break for the surfers. What this also meant was that just down from the reef, there was barely any waves breaking at all, so we had a very easy entry and exit. Unfortunately, the fact that the beach is known for its reef break, coupled with a larger swell in general, meant that our dive conditions were less than ideal. 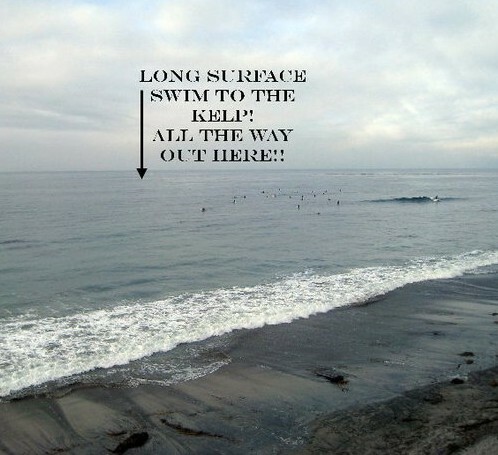 The reef at Swami’s is fairly shallow, and the large swell moving in from off shore created a big surge underwater and pretty poor visibility. My dad handled this fine however, especially when we got separated about four minutes into the dive. Thats right, I lost my dad after only four minutes. Way to go me! Truth is, I paused for a picture while he and Dan (who was effectively leading the dive) continued to swim, and with the 5-10 ft viz, I lost them quickly. My Dad was a little left of Dan, so when he stopped to check on everyone and discovered I was not there, my Dad continued swimming. I caught up with Dan, but then Dad was gone! Dan and I searched, then surfaced (after what was probably only about 30 seconds as my mind worried over my missing father) and looked for bubbles on the surface. Meanwhile, we discovered later, my dad continued swimming along, thinking us just up ahead, and forgetting the 1 minute search rule we had decided upon before the dive. Finally, after what felt like forever, but was probably only a few minutes he surfaced about 50 yards up from us, opposite of where we were looking for him. Crisis averted we swam over to him and dropped back down. The highlight of the dive was finding a large Moray Eel inside a hole that Dan nearly put his hand down in search of lobster. 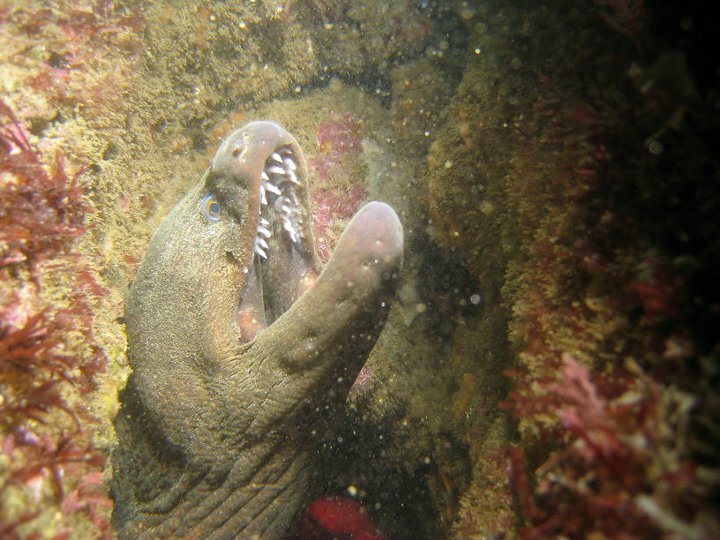 The Moray poked its head out and started opening and closing its mouth in a fashion that makes you think he’d be hissing or growling if it were on the surface. Yes, those little black dots in the water are surfers! Moving on from there we found a couple lobster, however any that Dan was able to grab were too small to keep, sadly no delicious crustacean dinner. The rest of the dive was spent swimming around, exploring the kelp and searching for lobster hidey holes. We surfaced when my Dad finished his air, quicker than the more experienced divers, but not so fast that it was annoying, we enjoyed a nice 37 minute dive. The water was summer warm around 60 degrees at depth, and the only drawback was in the form of the extremely long surface swim to and from the dive site… almost a 1/4 mile! Its definitely a sight I’d like to try again, maybe with a kayak and definitely with less surge and better viz. Mostly though I enjoyed just getting under the water with my Dad again. Next up: Mom. (I think that effort will require somewhere warm and clear). A perfect summer day, in the middle of October. Taking a break from paddle boarding, we went back into the ocean for some body surfing.